Frankye Regis recounts her childhood as a black girl growing up in rural segregated Mississippi during the 1960s and '70s. She was a farmer's daughter, one of eight children, who spent her summer vacations picking cotton in her father's fields. She wouldn't dare look a white person in the eye if she passed one on the street. Her high school was not integrated until 1980, 25 years after the Brown v. Board of Education decision stated segregated schools were illegal. Throughout her first-person memoir, Regis provides the history of the civil rights movement in an accessible manner to help students place the personal narrative in historical context. Original and historical photographs are provided to help readers better understand the experience of being in someone else's shoes. This is the third book in a new series, Voices of Twentieth Century Conflict, directed towards high school students. Each story in this series is told through personal vignettes and reflections that chronicle the life and times of the author with historical context unifying and clarifying the events. The lively writing style and engaging stories help history come alive for students learning about Civil Rights. Also included are a series foreword, timeline, glossary, and Questions for Discussion and Reflection for each chapter. Also available in this series are A Voice from the Holocaust and A Voice from the Vietnam War. 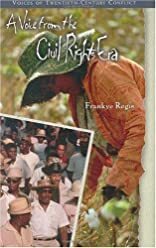 About Frankye Regis (Author) : Frankye Regis is a published author of young adult books. Published credits of Frankye Regis include A Voice from the Civil Rights Era (Voices of Twentieth-Century Conflict).